I sometimes get asked about readers and those children that are in their prime learning to read stage. 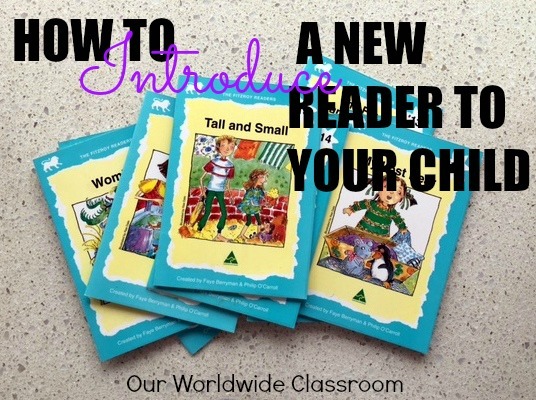 One question that often arises is that of, 'how do I introduce a new reader to my child'. This is by no means intended to be the only way, it is simply what I have found that works for us here. I am now onto our third and final child that is just about at the stage of reading early chapter books and my time as a homeschool mum introducing early readers to my kids will be over. So you have brand new beginning reader on your hands. Maybe they know all of their alphabet sounds and possibly can sound out a few simple words and so you feel it is time to make a start on introducing readers to your child. "Readers are most often a set of books that children (and their reading mentors) utilise to work their way through the sounding out of simple words and letter combinations, slowly and systematically progressing them into more detailed texts." Most readers at this stage will have a focus, it may be a short vowel sound in the middle of what is known as a CVC word (vowel consanant vowel). 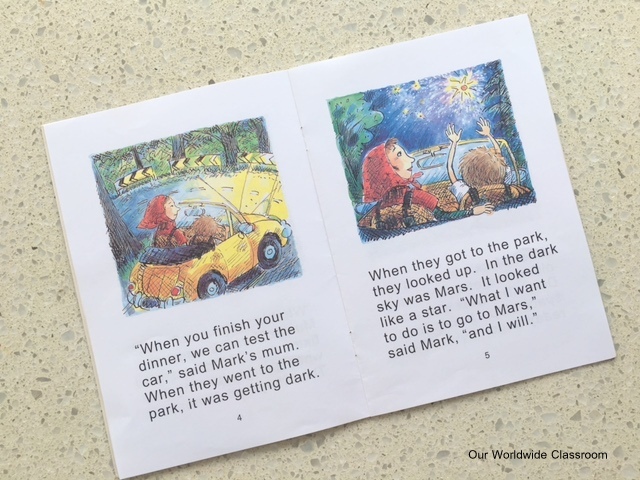 So could be something like 'dig' where the focus of the book is to practice words with the short vowel sound 'i'. This step in the process is to introduce the new sound, in the lower level readers it is most always a single letter sound but will progress into letter combinations, such as blends, like ch, ck, sh and then onto longer combinations of letters that make a single sound. For example here in this particular reader titled 'Mark and Mars' the new sound is made up of the letter combination 'ar'. We will read the title together, talk about the sound combination and try and come up with some other words that might use that sound all before we even open the book. I read the story. Yes, I read it from cover to cover, not my child. Let's face it the whole point of introducing a reader like this to a child is because they don't know the new sounds that are going to be presented. If they could already read the words why would we bother even introducing the reader. However, because they don't know the sounds it can make for an anxiety driven time trying to focus on what they've recently learned in earlier readers, sounding out words that may be familiar to them and then also trying to add in the brand new sound in a series of words that they most likely have never come across before. Let's not forget that at the same time they are trying to read for comprehension. Put all of this together and many young children simply do not cope. So together we cuddle on the couch and I read. That way we both to get to enjoy the story (the stories generally get better as the readers progress in levels), we get to know the story and we understand the premise behind the text. We will have a brief chat to check for comprehension at the end of the story. We go back through the story looking for the words that contain our new sound, which in this book is 'ar'. We spend time sounding out those words and saying them out loud to ensure we have the correct sounds coming out. This is often a time for lots of giggles, especially with letter/sound combinations that may be a little different. That's basically all we do on the first days introduction of a new reader. We always have a couple of books that are at a lower reading level which we use to help build fluency and practice recently learned sounds. So now is the time the child reads those out loud. This step happens the following day. We remind ourselves of the story and the new sound that we are on the lookout for. Then it's time to begin reading. As you can see from this particular reader we are at the stage of having several short sentences on each page. So that my new reader is not overwhelmed we take turns. Sentence by sentence. That way he can focus on what he needs to focus on, he hears me reading and modelling with every new sentence and he isn't overwhelmed with the length of each page and in turn the entire book. We continue in this turn taking fashion for the remainder of the book. Then it's time for fluency reading with some lower level readers. This step happens the next day. Step 5 in essence is exactly the same as step 4, however we swap. If I went first in step 4, then he goes first in step 5. Step 6 happens the following day. By now we are on our fourth day of reading with this new book so the story line and the new words are mostly becoming quite familiar. Sometimes this is a slower process depending on the particular sound combinations. Here we read an entire page each, but still taking turns until we've come to the end of the book. Day five into our new reader. This particular step is when I need to assess how things are going with the book and the new sounds. If he has picked things up with relative ease today will be the day that he reads the entire reader out loud and it will then get added to the fluency pile. If it was a little tricky we will complete step 6 again, but swapping with who goes first, so we are reading different pages. Depending on the book, the sounds that were introduced and the child we spend somewhere around a full week on a new reader. This can be easily shortened or lengthened in time depending on how much progress is being made. It's time to start all over again with a new reader. And really, it is as simple as that. I am not a qualified reading instructor. I am simply a mum in her eleventh year of educating her kids at home and this is a process that, through trial and error, I have found, works for us. 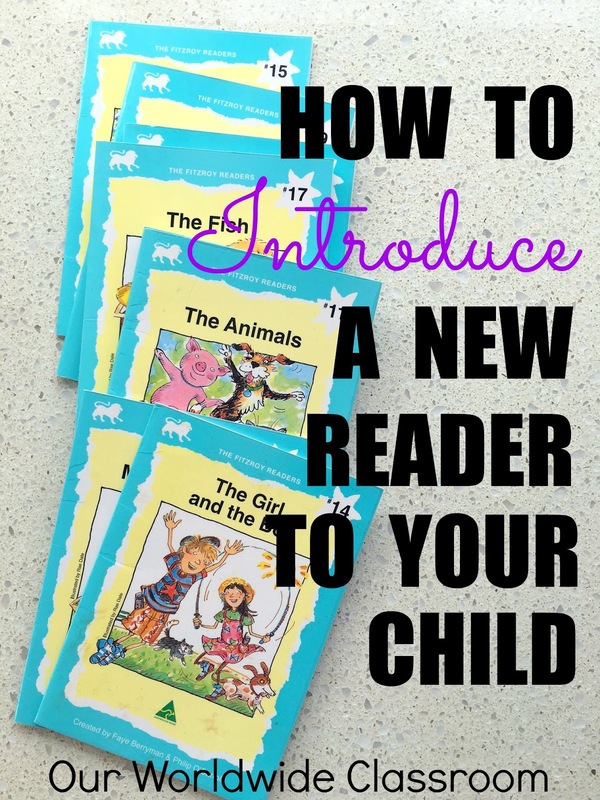 If you are struggling with introducing new readers to your child, I encourage you to give something like this a try. Be sure to let me know please if it helps in anyway. Have you looked at my Pinterest Boards lately? Visit Our Worldwide Classroom's profile on Pinterest. These are great ideas!! I have one that is about to be a budding reader and I'll have to try this approach with him! I'll sure to pin this on my ideas to share board! This is really terrific! Wish I had this post when I was helping my niece out!